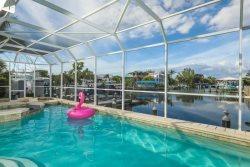 Gasparilla Vacations | Sunrise Manor with Fantastic Bay Views! Welcome to one of the most outstanding views on beautiful Boca Grande! This stunning custom built 4 bedrooms, 3 baths home boasts over 3,000 sq. feet of waterfront living. Marvel at the beautifully decorated coastal décor highlighted with warm tones and natural wood accents throughout. The 1st floor boasts vaulted ceilings giving this home an open airy feel. The fully equipped modern kitchen and dining areas have ample seating allowing ease for entertaining and the expansive deck provides guests with consistently impressive views, and refreshing salty breezes fully connecting you to the sea. The master suite features a king size bed, and an en-suite bathroom. The 2nd living level has clean simple décor and includes 2 waterfront bedrooms with access to a large covered deck offering unimaginable views. A short climb up to the seawatch room will showcase 360 degree views of the tropical landscape around. Take the elevator back down to the lovely paver patio that accompanies your backyard oasis and leads you directly out to the water. Book today and secure your opportunity to capture the best of the Boca Grande lifestyle. Monthly rentals available, call for more details. Check in time is after 3:00 pm. Turn off all lights, close all windows, and return key to lockbox. Grande Quay is a small community with single family homes overlooking Charlotte Harbor at the north end of Gasparilla Island.